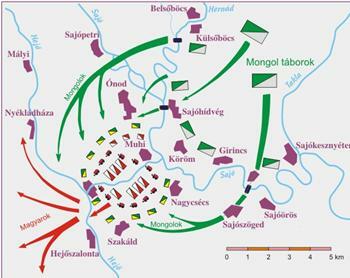 The Battle of Mohi (Muhi) or Battle of the Sajo' River (April 11, 1241) was the main battle between the Mongol Empire and the Kingdom of Hungary during the Mongol invasion of Europe. It took place at Muhi, southwest of the Sajo' River. After the invasion, Hungary lay in ruins. Nearly half of the inhabited places had been destroyed by the invading armies. Around 15–25 percent of the population was lost, mostly in lowland areas, especially in the Great Hungarian Plain, the southern reaches of the Hungarian plain in the area now called the Banat and in southern Transylvania. The downloaded file contain all necessary folders for Ai's and sounds. Just unzip it to main aoe2 folder and play it. The map is a campaign, not a scenario. The scout thing is misleading. You're not supposed to explore at all. Exploring doesn't help what you have to do is run through to reach a lighted and recognized goal. Randomly defeated during bridge battle. Maybe we have to keep a hero alive but that is secret? 2 torches were red. Exploring only mean, send scout to flag near Mongol's camp. At bridge battle, you mustn't let Mongols get the bridge. When they are reach the bridge you lost. The four torch show you who's control the bridge currently. If all green you lose. Best way just simple not let any mongol reach the bridge. Kálmán and Béla must be alive during the battles. About colors, at start you don't have anything. After you got the order, you get 3 scouts, if you explored (or not) you gain all unit (except Béla and his guards) + Barracks, Markets, Archeries and Stables. Later, in confusion, you lost control of your army, they just run away, only Béla and his Guards controllable. I couldn't get past the rocks blocking the moutain pass. I'm assuming a trigger was supposed to remove them, but I couldn't understand your triggers since they are not in my language, but I think whatever trigger was supposed to remove the rocks didn't work. Why when the player loses the control of all units, except for the hero units, the player can't control the prince or the hero monk? Is it supposed to be like that? Archbishop Ugrin was killed, but Kálmán and Béla managed to escape though, but Kálmán's wounds were so serious that he died soon after. 1 - During the first battle at the bridge, when the Mongols are supposed to run away, not all of them didn't. A lot of the ones attacking the player's units are left behind, to continue attacking units until they are dead. Maybe force the enemy units to really go back (via trigger or "offlimits" area) to show that they are indeed, retreating. 2- I find that the enemy have a really big army and I have tried 3x in winning, but end up dead. :( And this, despite of me playing in Normal. So following standards set forth by other reviewers, I might give the scenario a very very low score. 3 - Why can't the player take control of Prince Kalman? Everytime I make a run out for the mountains, unable to control Prince Kalman, he ends up always dead, the defeat trigger fires. I suggest that either give control to Prince Kalman, or turn off the defeat trigger related to him. 2, This battle CAN NOT be won. Only you can reduce the extent of the defeat by saving the king. If it is too difficult to play the normal difficulty, try it in easy mode. Your Score, your opinion. I can not make for everyone a good map. 3, In the last task you CAN ONLY control Béla and the two templar knight. (if they are still alive) Béla fled to the mountains only. Kálmán and the survived soldiers fled to Pest. While Kálmán run south the lose trigger turn off, before Kálmán disappear. I do not understand why it is not done with you. Make sure Kálmán to be able to escape. by winning I mean being able to save Bela and his companion (what they call as victory-in-defeat). :) Well, I'll give it another try, and afterwards, I might as well give a review. I ran into this problem too, best idea is to run Kalman towards the south once you gain control of him to avoid this bug. Gallas- to avoid this problem, loop the trigger tasking Kalman to the south, and make him invincible (change HP: 10000) or something like that. Nice trick, btw, with garrisoning Bela inside his mounted form. I've never seen that done before, although I heard you can do stuff like that with Trigger Studio.